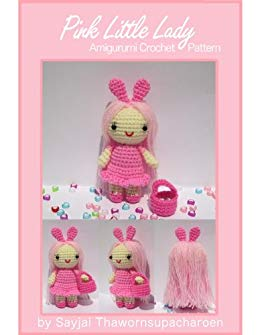 Crochet pattern to create a pink little girl doll. The doll can be made using any yarn you wish. Choose a hook size that matches the yarn. Materials which you can use: (not included): 1) 3.00 mm hook2) 4 ply yarn (cream, pink, dark pink and red) 3) Mohair yarn (light pink for hair) 3) Black embroidery floss4) Polyester fiberfill5) Two 4 mm black beads for eyes or other eyes as desired6) Tapestry needle8) Sewing needle and thread for attaching eyes Size: Pink Little Lady is 4.5 inches/ 11.5 cm high (excluding the rabbit ears)Disclaimers:- Please note that with the Kindle the pattern cannot be printed. If you use Kindle for PC on a desktop computer this might be inconvenient. Also note that this pattern is available for free on my blog. It's sold in the Kindle store as a convenience for those who like to download it onto their Kindle. - The finished dolls are not suitable for children 3 years and younger because of loose parts.